To contact us regarding a Corporate Account, click here. If your company has vehicles that deserve the very best in lubrication, maintenance and cleaning, you should consider opening a Landis Wash & Lube corporate account. We know that time is money, and you don't have time to lose your company vehicles for a half of a day, while they are serviced. We can service your vehicle in a matter of minutes, and we are open seven days a week. Enjoy the freedom of not having to schedule an appointment. And, no more keeping track of paper receipts. We make the record keeping easy! Each company car will be identified and tracked by either it's license, vehicle identification or fleet number. A detailed invoice will be sent to you once per month with 30 day payment terms. Now you can make sure that your fleet looks great and runs great, and leave all the record keeping to us! All that you have to do to maintain the active status of your fleet account is to spend a minimum of $35.00 monthly, on any of our wash and/or maintenance services. Also, and most importantly, if you exceed $100.00 in monthly billing, you will qualify for additional discounts, which will automatically be shown on your monthly invoice. 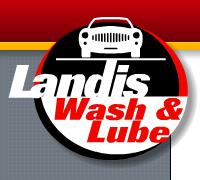 If you would like to arrange to set up a Landis Wash and Lube Corporate Account, or discuss this program with our management, please give us a call at 717-625-0505 or click here.